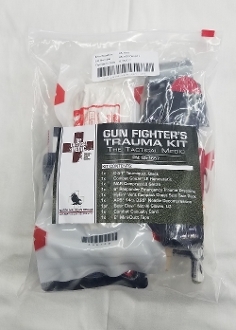 This kit allows you to treat injuries related to GSW (gunshot wounds). The contents themselves are individually packed and sterile with instructions on the packaging all sealed in a re-sealable heavy duty outer bag. HyFin seals for “sucking” chest wounds, decompression kit for treating Tension Pneumothorax, Hemo Static Gauze for Staunching major/arterial bleeding* , Tourniquet, compressed 4.5”x110” rolled gauze, the proven ETD Bandage and a pair of nitrile gloves. *Kits will ship with either Celox Rapid or Quick Clot Combat Gauze depending on current inventory. If you have a preference, please indicate it in the notes section when you check out.